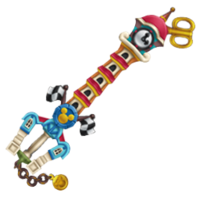 "A Keyblade with above-average reach that makes it easier to land critical hits." Clear the "Rumble Racing" minigame. 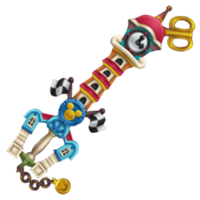 The Victory Line is a Keychain for Terra's, Ventus's, and Aqua's Keyblades that appears in Kingdom Hearts Birth by Sleep. The Victory Line's shaft resembles a tall, orange and red clock tower. Terra has the longest version of the Keyblade, and his version actually depicts five floors instead of Ventus and Aqua's four. 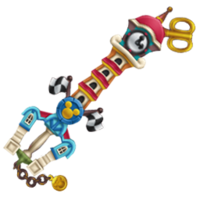 A large, gold key turner juts out of the clock tower's pink roof and forms the teeth of the Keyblade. The base of the blade sports a yellow hidden Mickey symbol set in a blue circle. Two checkered flags are present on either side of this circle. The guard and handle resemble the buildings in the Raceway area of Disney Town, and sport blue roofs with white columns. The Keychain has three large, circular links and a gold medallion emblazoned with another hidden Mickey as its token. The Victory Line's name references the finish line of a race, specifically a Rumble Racing circuit. Its Japanese name, "Winning Medallion", references the medal the victor of a race might win, as well as the token on the Victory Line's Keychain.